Wisdom of Life. : She is superstitious! William is a caring son, who has effected a medical insurance for his mother quite recently. Within a short period after the policy was delivered to her, the mother had a very nasty domestic accident. While cooking at home, she accidentally fell over a hotly boiled soup. Both her tights were badly injured and burned. Her movement was restricted with so much of discomfort and inconvenient. Before she could fully recover from these wounds, last night William informed me her mum was admitted to the hospital again. She needed a minor surgery to remove a sharp pointed fish bone which penetrated into one of her index finger. What an accident! I had heard of fish bone got stuck in the throat or mouth but never with finger. Over the phone William said, "My mother complained when I wasn't caring for her. Now that I had purchased a medical plan to take care of her welfare and health, she again complained. To be an obedient son isn't easy!" According to her mother who is a typical housewife, she had not admitted to hospital before in her lives. Before having this insurance, she never had any accident or bad experience of such. However today when the insurance was bought for her by the son, she claimed bad luck as bestowed upon her. It was unlucky for her to have two nasty accidents happening so close together at home. As a superstitious lady, she insisted this is bad luck. Whether is bad luck or good, all the expensive medical charges were paid by the insurance. I am sure, the son is happy that the policy was there to take care for his mother medical needs. 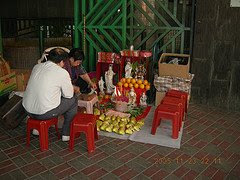 Whereas the mother is an unhappy and an unsatisfied customer who believes in superstition. For the one who is reading my blog now...may I ask, "Is she lucky or unlucky?" Poor lady,she is truely unfortunate. Its the basic Rule of Earth. You assume the rule of earth is bad luck then thats the energy the earth will give you...BAD all the time. If you are full of believing good luck, then the earth surrounds you with positive energy, life will be more easy to live in and more care and love will surrounds you regardless all the trials given to you. I am glad you are always a positive lady who inspires. That is why you are my sister from far.